You are currently browsing the archives for the Mary Franson category. Why does the DFL hate farmers? I just wrote this post about Rose and John Lang. They’re farmers near Richmond, MN. 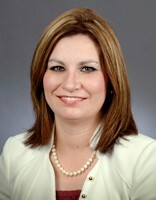 Rep. Mary Franson represents a rural district with lots of farmers. This morning, Rep. Franson took to Twitter to tell people about the crisis-causing health insurance premiums. One story she told talked about Vern. According to the notification letter Vern recently received, Vern’s monthly premium for 2016 was $961.12. 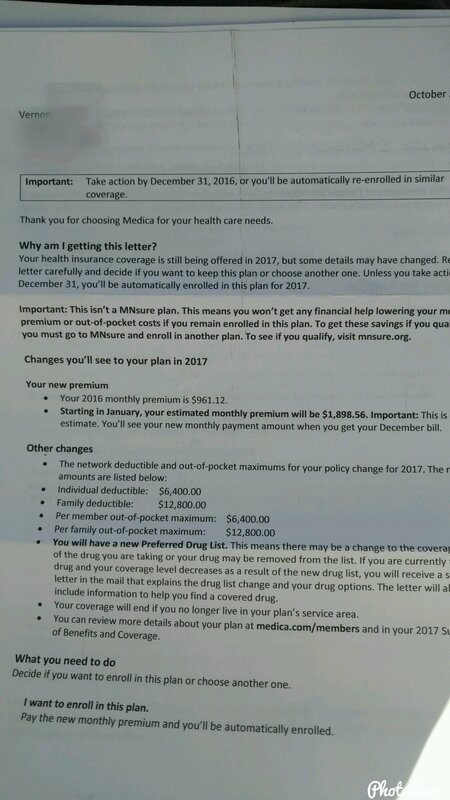 According to the letter, Vern’s plan isn’t a MNsure plan so it isn’t available anymore. 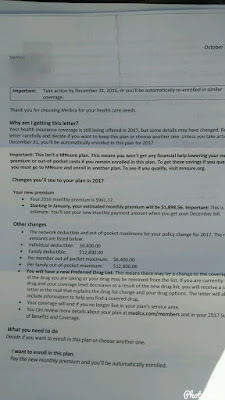 The cheapest plan available to him through MNsure will charge him $1,898.56 a month. This year, my premium is going up 96 percent. Ninety-six percent. My monthly payment, which was the amount of a decent car payment, is now the size of a moderate mortgage. The president refers to these for thousands of citizens as ‘a few bugs’ when to us it feels like a flameout. For this astronomical payment, I get a plan with an astronomical deductible that my healthy family of three will likely never hit except in the most catastrophic of circumstances. The fact that Gov. Dayton, Tina Liebling and the DFL are attempting to defend the indefensible is offensive. Repealing the ACA isn’t throwing out the baby with the bathwater. The ACA is nothing but bathwater. When the DFL pushed the forced unionization vote down the child care providers’ throats, LFR reported on the fight between the child care providers and the DFL’s special interest allies. Though I wasn’t there at the Capitol, I watched until 6:00 am via the House’s livestream. That’s how I gathered the information that went into this post. The DFL loves to talk about how they’re the party of the little guy. That’s BS. Child care providers rejected AFSCME unionization by a 72%-28% margin. The only time they side with the little guy is when the little guy agrees with the DFL’s special interest allies. Period. 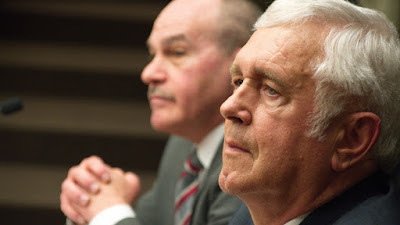 Senate Minority Leader David Hann, R-Eden Prairie, said Dayton administration “did not follow the law” when it set up the election, ruling that many providers did not qualify for ballots. Sen. Bakk will block the GOP’s attempt to repeal the law because he can’t afford to piss off AFSCME in an election year. It’s that simple. Sen. Bakk isn’t about to fight the special interests that contribute to DFL campaigns and comprise the DFL’s GOTV operation. Greetings all Conservatives of the Republican Party of Otter Tail County!!! After much deliberation, thoughtful prayer and talking with my family, I have made the decision to seek the Republican endorsement for the seat in the Minnesota State Legislative House of Representatives belonging to District 8B. I have notified our deputy chair, Jim Eitzen and he will be taking over the reins and the gavel. I have started work on our County convention for March and will turn that over to Jim and others to make that convention highly successful. I trust that we will all pull together behind our acting chair and his committee to continue the outstanding work of Otter Tail County. As always best to you, God’s peace and thank you for the opportunity to work with and for you!! Since Ms. Nelson brought it up, I’ll pay attention to whether she runs an issues-oriented campaign. I hope she does. Finally, one of the reasons I like Mary is because of the leadership role she’s taken in defending the First Amendment in the context of fighting the DFL’s forced unionization scheme. Mary has fought the right fight against a formidable opponent because it’s the right fight to pick. Mary, along with Hollee Saville, were the best leaders in the fight to protect small business owners and the First Amendment. As a kid, you dreaded hearing the phrase, “other figures sold separately,” at the end of a toy commercial. It meant you weren’t really getting what you were seeing on the TV. That’s kind of how I feel about the upcoming special session in September. Shortly after session ended in May, I heard some Democrats say they wanted to repeal the business to business taxes included in the final tax bill. However, when the opportunity to stop the bleeding from this tax came upon us with the proposed special session, we only got the “other figures sold separately” line. This refusal to correct a “bad tax policy” means Minnesota will lose businesses and the jobs these businesses provide along with consumers being forced to pay more for products. The B2B tax on storage and warehouse services alone could cost our state over 7,000 jobs. Four states who tried the warehouse tax repealed it within six months. One state repealed it in two days. It’s not just jobs we stand to lose; every Minnesota family will pay more for groceries, medicine, personal care products, and much more. The Department of Revenue study notes that families will pay more when new business tax increases are passed on to consumers. In fact, this same study shows that the people who earn the least amount of money will pay the most for the $2.4 billion in tax and fee increases passed by the Democrat-controlled Legislature and Governor’s office. Though the Democrat leaders announced today that they won’t fix this problem in the September special session, my Republican colleagues and I will continue to encourage them to correct this huge mistake. We cannot afford to lose any more jobs and we should not force higher prices on already struggling families. The DFL imposed huge new tax increases this session, including a telecommunications equipment sales tax, a farm equipment repair sales tax, the warehouse sales tax and a gigantic cigarette tax increase. met with a wholesaler in my district this week. C-stores along border struggling. Gov. Dayton and the DFL have made overtures towards green energy companies in an attempt to lure them here from other states. Unfortunately, they’re punishing companies already operating in Minnesota. Playing favorites with the economy is what helped drive the US economy into the Great Stagnation. Apparently, Gov. Dayton and the DFL didn’t learn. Apparently, they think that they can follow the same pattern and get better results. That’s either foolishness or arrogance. Either way, it’s counterproductive, which is what Gov. Dayton’s and this DFL legislature’s reputation should be.